Kerala Association of New England (KANE) - KANE Announced "KList"- Connecting needs, indeed! Kerala Association of New England(KANE) announced a new brand "KList©" on November 1, 2014. KList is an interactive classifieds listing and location search service on kaneusa.org. Conceived and designed by Mr. Jollson Varghese, the primary goal of KList is to provide an interactive platform for people to post their needs and find different service and business offerings local and remote to their current location. KList not only connects people, but also connects locations in an interactive way via map based hotspot search and filtering. The mission of KList is to motivate people share any point of interest they might know helpful to others, which underlines KANE's slogan "Together Everyone Achieves More". Classifieds: Anything and everything you want or offer goes here. Not an other craiglist, but a lot more features compared to other classifieds portals. We can do any level of customization in categories, cities, submission form fields, workflows etc. This is free and is open to all. if you want us to make a new category or add a new city or new fields in any submission form, let us know. 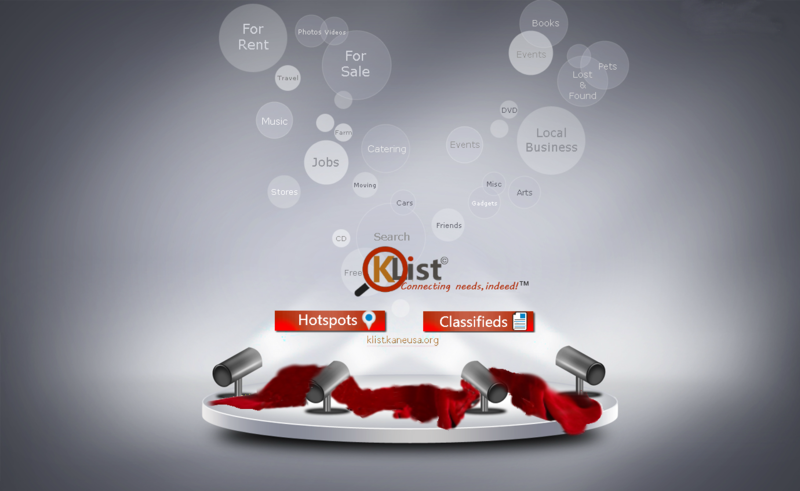 KList's classifieds is a self service interactive portal that supports private messaging . View KList classifieds page. "I am really excited today and glad that KANE is unveiling KList on Kerala day. This is a true dedication to our community and a revolutionary milestone in KANE's history that redefines and transforms the way we search for our needs. I didn't have a second thought when it struck my mind "Connecting needs, Indeed! TM", to use that as the slogan for KList. This is not just for KANE members, but to the entire Malayalee and Indian community in New England, I dedicate", said Jollson Varghese.